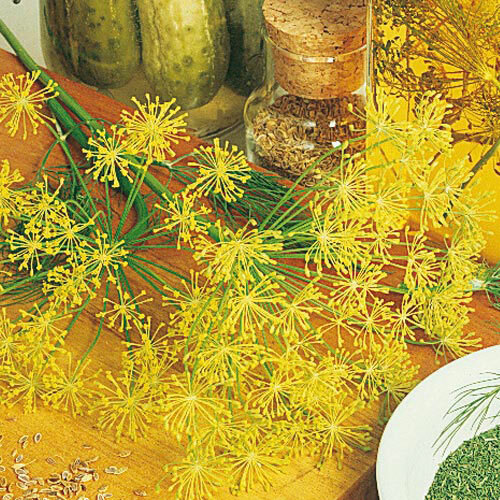 Mammoth Dill Herbs | Gurney's Seed & Nursery Co.
Pungent seeds are a must for your pickling brine. Feathery leaves perk up fish, seafood, dips and sauces. Use dried, fresh or frozen. Annual. 60 DAYS. Flower FormSmall yellow flowers in clusters. CommentsStems, foliage, and heads are aromatic. Annual or biennial. Parts used: seeds and leaves. Attracts bees and other pollinators. Garden fresh, gourmet flavor.